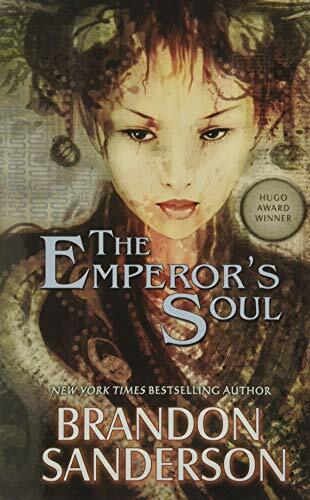 So Sanderson's fans can be forgiven when they open his novella, The Emperor's Soul , for skipping to what they may feel is the true heart of the book: Forging. Wan ShaiLu is a Forger, someone who "could change the nature of reality itself" (p. 12). This is accomplished through intricately carved soulstamps that "rewrite" the history of an object to "become a better version of itself" (p. 51). Just how this is done is withheld for a few pages, but the novella's plot comes in early: the emperor has survived an assassination attempt, but it has left him mindless. The emperor's wife did not survive, and the court is in an official hundred day mourning period, after which another court Faction will seek to replace the emperor. The Arbiters, the emperor's closest advisers and ministers, seek to avoid the empire falling into lesser hands (and losing their lives). To save the empire, and themselves, they have only one option: fake it. They'll try to replace the emperor's soul with a forgery. This is where Shai enters the story, and we first encounter her in prison. A small woman who wears glasses, Shai's exterior hides a razor sharp wit, keen sense of observation, and astounding artistic ability. She's also an accomplished liar, thief, and con artist. To further complicate matters, her magical art of Forging literally transforms objects by convincing the object it has a different past (a plain wall becomes a mural, a clay vase becomes an ornate piece of china, a mild-mannered scholar becomes a trained warrior), and rather than see this as a wondrous art the Arbiters view it as illusory and despicable. And now the fate of an empire rests on her skills—and on her captors' ability to trust her. Sanderson is generally good at characterization and worldbuilding, and very good at magical systems and plot-based action, and these all remain true for this novella. But what truly sets this work apart, what makes it worthy of the Hugo nomination it has received, are the larger philosophical questions the text deals with on the nature of art, the role of artists, and who art belongs to. This discussion is established early, when the Arbiter Gaotona wonders, "Why would someone capable of this artistry, this majesty, turn to forgery? . . . Why not be a true artist?" (p. 12). When he hears that Shai destroyed a masterpiece after replacing it with a forgery, Gaotona is outraged. Shai was hired by the original artist to steal and destroy his greatest work, and as such she believes her actions justified. Gaotona disagrees, saying, "It belonged to everyone who saw it. . . . Destroying a work of art like that is never right" (p. 120). Gaotona wants to see himself as a champion of truth, and his political faction views the magical art of Forging as the antithesis of truth and therefore an abomination. This causes him to view Shai as someone who has wasted a great talent to become a base thief, liar, and illusionist. But he's also a pragmatist, as when he presciently remarks, "There are . . . times when one must accept the aid of darkness in order to contain a greater darkness" (p. 43). Thus he is not quite the hardline antagonist he initially seems. The story gets away with a curious and intellectual Gaotona because the real danger to Shai comes from numerous other sources: the guard captain, Zu, wants very much to kill her; another Arbiter, Frava, wants to use Shai to mold the emperor's soul to her will; the ninety-nine days Shai has to complete her task before she and all the Arbiters are killed and the empire overthrown; and the Bloodsealer, a type of Forger who uses Shai's fresh blood to bind skeletal monsters to her scent should she try to escape her prison. There is tension to spare here, and just to make sure we're well aware that time is running out, the chapters are titled with the number of days Shai has been working. "So you could have painted this wall yourself." "I don't have the paints." "But you could have. You could have demanded paints. I'd have given them to you. Instead, you created a Forgery." Shai knows how talented she is, and she takes pleasure in impressing others with her skill. For a proud woman like her, Gaotona's paternalistic advice is received as condescension, and part of her wants to prove to him that what she does—carving soulstamps and rewriting an object's history—is just as artistic and beautiful as what a normal painter does. If this sounds a little too familiar, the theme does echo strongly throughout nerd culture: the older, authoritative figure who doesn't fully appreciate the true value of the younger upstart's passion, and wishes she would follow a more traditional path. But this tried-and-true approach takes a fresh spin here with Gaotona's moral objections to what Shai does (he calls her art a corruption, an abomination, disgusting, and vile), and, just as interestingly, the Stockholm and Lima syndromes that develop as a result of Shai's captivity and Gaotona's daily visits. Watching Gaotona and Shai's relationship develop, and their own defenses come down as a result, is one of the more enjoyable aspects of this text. Shai's pride also complicates her escape plans. She knows she should escape, leave her work incomplete, and "give them a lesser emperor—a puppet they could use" (p. 85). The problem is that she can't do it: "That wasn't the challenge. . . . Deep down . . . [s]he wanted to make [the emperor] live" ( ibid ). Because of this, Shai stays long past the time it would have been safe to escape. When presented with one last chance to flee, she is torn between the desire to escape and the desire to complete her greatest work, her own masterpiece. As with the painting she destroyed, Shai must decide who her masterpiece truly belongs to: herself, or everyone whose lives the emperor will touch. There are great little details scattered throughout the text as well, such as Shai's mantra about how to properly deceive ("Respect the people you lie to" [p. 84], which we could apply just as well to the relationship between a writer and his audience); the way she describes the smell of the emperor's rooms as "too clean. Too white. Like a blank canvas" (p. 139); and the echo of Foucault's Panopticon when the Bloodsealer presses his bloodied seal into Shai's door, leaving "a glowing red seal in the wood . . . shaped like an eye" (p. 43). The threat posed by the Bloodsealer's skeletals causes the captive Shai to begin policing herself—but unlike Foucault's ideal prisoners, Shai has a plan for confronting her unseen guards. This slim volume packs quite a punch by hitting on many levels: relationships, plot, magical systems, aesthetics, and even metaphysics: "One can cut the body, and it will heal—but do it over and over again in the same spot, and you will scar . The soul cannot be so different" (p. 101). The book isn't without flaws, however: as villains, Frava and Captain Zu are scarcely more than stock characters, and the Bloodsealer is only slightly more fleshed out with details about his personal life. But Shai and Gaotona feel whole and almost real, and their relationship is a joy to read. The thriller pacing may not be for all readers, especially those more accustomed to sinking into the depths of massive worldbuilding, as the confined setting, quickly moving plot, and spare descriptions come across more like the narrow view of a camera lens than the expansive view fantasy readers are accustomed to. But these qualities are not to be dismissed, particularly when they are supported by intriguing ideas, a well-balanced and tightly focused story arc, and a likeable yet flawed main character. Ultimately, Sanderson delivers a thoughtful yet exciting read that is difficult to put down and save for later. Even the novella's aesthetic debate is satisfactorily resolved, and it's a touching moment when Gaotona reflects, "True art was more than beauty; it was more than technique. It was not just imitation. It was boldness, it was contrast, it was subtlety. . . . Raw, yet polished. Reckless, but calculated. Awesome, yet unseen" (p. 167). Perhaps there is a touch of Shai's own pride in those lines, as they wind down one of the author's greatest works to date; whether or not that pride is justified is a question best left to the readers, but you won't find this reviewer objecting if the novella takes home a certain spaceship-inspired award in San Antonio this September. A. S. Moser is a writer currently in between homes and countries, and prefers it that way. His novella, Libations , appeared in the Summer 2011 edition of Kaleidotrope. You can follow his travels at his blog, Wanderlust for Beginners. A. S. Moser is a writer and teacher. His current project is a near-future novel about rising seas, the collapse of currency, and smuggling. For more, follow him on Twitter.